Did you know most people only use 10% of Slack? Crazy, right? While it’s marketed as “a messaging app for teams,” it’s so much more than that. Of course, the idea behind Slack is that it saves you time and increases your productivity. But if you’re using it, you probably don’t have a whole lot of time to spend learning how to use it. These simple tips will help you discover Slack’s hidden features. Note: Since publishing this post, we’ve blogged about How Slack Has Completely Changed the Way We Work at WPMU DEV. Seriously, Slack has helped us organize and release a whole bunch of awesome products recently, including our performance and optimization plugin Hummingbird, our answer to your security woes, Defender, huge updates to WP Smush (the most popular image optimization plugin for WordPress, by far! ), and big changes to our SEO plugin SmartCrawl. Thanks Slack! 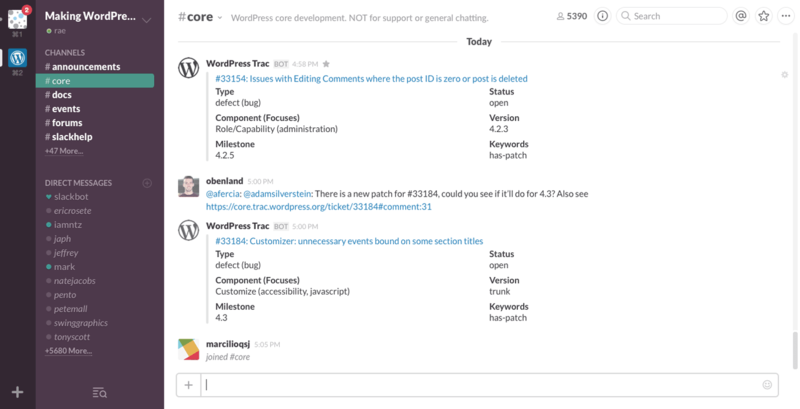 Here’s what the WordPress Slack account looks like. Keyboard shortcuts are undoubtedly one of the fastest ways to speed up using a piece of software. Slack is no exception. You can replace <ctrl> with <⌘> if you’re using Mac OS in the following list of the best few. 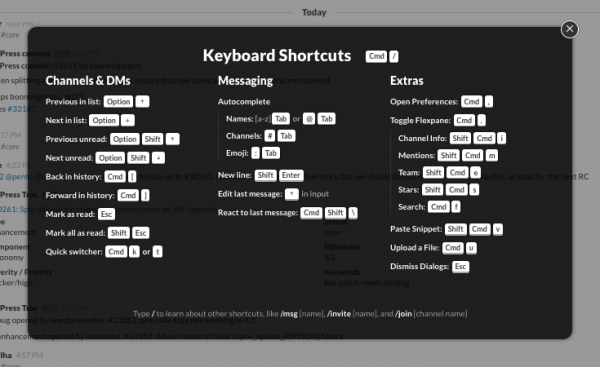 You might also want to take a look at the additional options available to turn certain shortcuts on in your Slack menu at Preferences > Advanced Options > Other Options. You can, for instance, make + bring up Slack’s search box rather than your browser’s. If you want to find any more, there’s a helpful guide to Slack keyboard shortcuts on its ZenDesk Knowledge Base. To bring up the keyboard shortcuts screen, type /keys in any channel. One thing that makes Slack really great is how well it works with a huge number of other tools, integrating to bring your workflow into one place. Google Drive is used by many people and organizations for file sharing and collaborative editing, so Slack helpfully enables files to be integrated into its channels and messages. To connect, simply paste a link to a Google Drive file and Slackbot will give you options to connect – permanently, or as a one-off. Permissions can be revoked at any time if necessary, but this particular integration is an incredibly useful one for anyone already using Google’s advanced file collaboration tools. Alternatively, you can connect under the Configure Integrations menu. There are two particularly useful features in Slack that act as a result of certain triggers. The first is highlight words. You can find it in your Slack menu under You > Preferences > Notifications > Highlight Words. 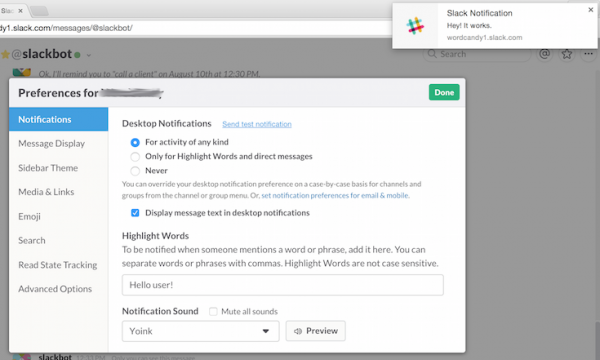 By default, you’ll be sent a sound notification when someone submits your Slack username. Using Highlight Words means you can choose to be notified when any other word is mentioned too. If you have an interest in a company blog, for example, you could ask Slack to notify you whenever someone writes the words “post” or “blog”. It means you’ll always be kept up to date on any discussions pertinent to your role. Hi [username]. I can help you with many different parts of Slack. For example, things like files, channels, search, starring, mobile, or keyboard shortcuts. You can click on those terms or type “/help” followed by any term you want help with (e.g., “/help files” or “/help search”). Or, if you just want to tell us what you think about Slack, you can type “/feedback” followed by whatever you’d like to say to the team at Slack. You can configure additional phrases under Team Settings > Customize > Slackbot Responses. One idea might be to send a reminder to remain focused on work when someone mentions the phrases “Facebook” or “YouTube” – if you think that might be something that occasionally slips your team members’ minds! Slack has a variety of different ways to format the writing you submit using a number of symbols in the text. Here are the ways you can use them to make your messages clearer. To make content bold, place *asterisks around it*. To italicize content, place _underscores around it_. To format content as code, place `backticks around it`. To make content preformatted, place ```three backticks around it```. To quote content, place a less than sign (<) in front of it. Hint: If you can’t remember these, type the format you want and a guide will appear on the right beneath your message box. Although it’s easy to star messages to save them for later, it’s not particularly obvious that specific direct message and channel streams can be starred, placing them in a handy favorites-style list at the top of the sidebar. To make the most of this feature, simply hover over the name of the direct message / channel when viewing it (in the top left) and a star will appear. Click it, and you’ll have selected it as a starred stream. Do bear in mind that starring a stream will remove it from the ordinary menu on the Slack sidebar; it’s sometimes easy to forget and get confused about where it has disappeared to! You can view all individually bookmarked items by clicking the star icon in the top right-hand corner of each screen. It’s a handy tool, making things easier to find for future reference. Reminders are a pretty important feature of Slack so you’ll probably have discovered how to set them quite quickly – by typing /remind me [at/in] [some time] to [do something] into any stream for slackbot. There are a few less obvious /remind features too, and these make reminders much easier to manage. Firstly, you can ask for a list of all your pending reminders with /remind list. Slackbot will show you what it will remind you of and when, also listing the ID of the reminder. In case you suddenly realize you don’t care about getting coffee for your colleague (or whatever else you’ve ill-advisedly reminded yourself to do in the future), the ID provided on the list can also be used to remove a reminder. Just type /remind cancel [id] to avoid being bothered for it. Slack has apps available for a variety of platforms, desktop (except Linux – sorry) and mobile (a Windows Phone version is on the way). On mobile, this brings the obvious advantage of keeping users connected more easily than a browser might be able to. It’s clearly useful to keep in touch if the team is communicating online through Slack all the time, regardless of the device. The apps actually have similar functionality to the browser version, they just work better on mobile. If you do choose to use the desktop version, you should definitely enable Slack’s Desktop Notifications under You > Preferences > Notifications > Desktop Notifications. These will send you clickable messages to draw your attention to any mentions or highlighted words so that, whatever you’re doing, you’ll be kept up to date with what’s happening on your organization’s Slack. You may need to grant special permissions for your browser to display them – in case you’re concerned, be assured that it’s perfectly safe to do so. Despite even its most expensive, most feature-rich plan costing only $12.50 per user per month (at the time of writing), Slack offers some fairly generous opportunities to earn credits, thus save money on bills. Some will be given to you without extra input on your part – for instance, some credits may be rewarded when a new user account is added to your Slack team – while other opportunities may be offered. $50 off billing for a quick survey is quite significant, especially for any teams on the smaller side. It’s well worth taking up these opportunities. A relatively new feature, Google Calendar integration looks set to be one of the most useful features in Slack (if you use Google Calendar, of course). While Slack is great for personal reminders, it doesn’t coordinate team reminders at the moment, but Google Calendar fulfils that need. Integrating Google Calendar opens up a number of options, mostly posting reminders to specific channels. Slack themselves suggest departmental channels and reminders or, sweetly, using it to send happy birthday wishes to employees automatically – others can then, of course, join in with their personalized ones. 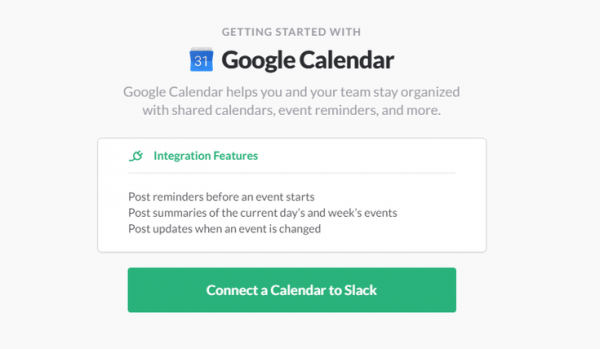 To integrate Slack with any or all of your calendars, go to Configure Integrations, select the Google Calendar option and follow the easy steps. As with Drive, it can be un-integrated again if necessary – but that probably won’t be likely, given how useful it’s bound to be. Because let’s be honest, why would you not want to append ¯\_(ツ)_/¯ to, like, every message? Head across to Customize > Emoji to add your own custom emojis. This can be a fun thing to do, obviously, but more pertinently you can add a set of custom symbols to enable quick image responses to messages. Add a tick icon to show a task is complete or develop a whole set of quick-reference images to send through the emoji system. Team communication has never been so slick! Especially useful if combined with customized emojis, the add a reaction tool can be useful to show a quick acknowledgement or actioned response. For instance, different colored circles could be used to mark progress on a task posted; each user can react to each message as many times as they like, so progress can be seen quickly and visually. For obvious reasons, this is not something you’re going to want to be doing the whole time, but it’s good to know that if you ever need to, it’s incredibly easy to move your whole Slack to a new subdomain. Simply head across to Team Settings > Change Team Name where you will also be able to alter the URL. There’s no need to despair if you haven’t starred an important message. If you can remember any detail like when, to whom or where it was sent, you can narrow down your search using Slack’s search modifiers. In case you don’t get enough chance to communicate with Slack, your colleagues can add Skype to their Slack profiles, and you’ll be able to call them. Just open up the Team Directory from within Slack and it’ll display their role within the organization and Skype details. In the unlikely and unfortunate event that someone gains unauthorized access to your Slack account, you can see exactly how and where they accessed it. Under Account & Profile > Access Logs, you can find a comprehensive list of when and how your account has been accessed. Although you can’t see it in the photo above (I removed it for obvious reasons), you can also see the IP address of the user – meaning you should know roughly where anyone who shouldn’t have been in your account came from. Although Slack should reduce the amount of email your staff are sending intra-organization, chances are you might well still need to be dealing with a ton of email. Lots of handy alerts on other services come via email too. A website form that posts queries to a #support channel. Signing up to alerts (eg. weather warnings) that post to local staff members’ channels, or #general if you all work in the same location. If there are any particularly interesting blogs or other feeds to which one subscribes (hint, hint), a channel could also be created to collate alerts for those. You can also tag members who might be interested in the content, and can function as good conversation starters for team collaboration and innovation. Typing in any hexadecimal (hex) code into Slack will create a little color swatch next to it. One use might be visualizing color palettes very rapidly for designers, but there are plenty of ways to use this trick effectively – not least making messages a little prettier. The only slightly disappointing thing is that all six characters must be used for it to work – #ffffff will work while #fff doesn’t render the box. Worth bearing in mind when using it. While it’s always advisable not to lose your devices when they’re logged in, Slack, like WordPress, gives you the option to log out of all other sessions. Just head across to Account & Profile > Settings > Sign out all other sessions. Slack’s Files system enables you to create different notes and code snippets in a variety of languages. The editor changes depending on language to format well, making it as good a browser-based text editor as you could hope to find. What’s more, it’s easy to share the code you’ve been working on to receive comments and feedback from within the Slack system. That said, you can keep snippets private in your own little sandbox for as long as you like. If there’s a time where you want to talk to absolutely everyone in your team, you can use the @everyone tag to send a notification to everyone person. @channel and @group can be used to notify everyone within a channel or group respectively, in a similar way. Meanwhile, @here will notify everyone who’s online (and using a desktop). In case you’re one of the embittered cynics who can foresee the ability to distract every single team member from their work with @everyone as open for potential misuse, Slack provides customizable restrictions on who can use such features. Jump across to Team Settings > Permissions > Messaging Restrictions to change the permissions. If you’ve got someone spending a little too much time in the #random channel (or need to take them out of a channel for some other reason), you can discreetly make it happen with the /remove command. Simply add their username and it will appear as if they’ve left the channel. To the avid gamers among you, never fear: /kick [username] has the same effect. If you’ve got a particularly important file – say a proposal document in a channel working on a particular job – you can pin it and it’ll appear in the Channel Info, making it easily accessible even if it was shared a while before. Simply find the file, choose More Actions and choose “Pin to #channel”. You can un-pin it at any time. Should you want your usernames to all be in a specific format, you can set instructions to ask users to format them in a specific way when they choose them. Go to Team Settings > Settings > Username Policy to set up a custom message. You can alternatively reset it to the default advice (shown below) if you’ve previously set it, by removing your custom message. Most people choose to use their first name, last name, nickname or some combination of those with initials. By default, Slack will only allow new users into your Team once you’ve sent them an invitation. If you’ve got a large team and you’ve already gone to the trouble of giving them their own email addresses, that’s a time-consuming task. Luckily, Slack enables you to permit any signups from a specific domain or domains. This means that you save time on adding your internal team, but you can still send out invitations to anyone else who might not have their own company email address. Slack has an awesome support team: if you ever have any questions or problems, you shouldn’t hesitate to go straight to them. They’re ultra-responsive and very friendly; even taking the time to write them a message will probably get your question answered quicker than if you try to figure it out yourself because they’re so fast. If you want to get help (they have a knowledge base to check first, too) or give feedback, you merely need to utilise the lifesaving ring icon in the top-right of the Slack control panel. A less useful, but also enjoyable feature can be found deep within the Slack menu options. Venture to You > Preferences > Advanced Options then scroll to the final “Surprise me” option. I won’t give any spoilers about what it does, but it’s quite funny. And one final fun tip – always be polite! Thanking Slackbot for its help should give you a lovely little response. Always nice to end a conversation like that… even if it’s with a robot. What Slack hacks do you use to be more productive? Leave your tips in the comments below. Slack is a perfect tool to enhance team’s communication. Everything is in one place – messages, files, and reminders. We also integrated our Slack with our time tracking tool – TimeCamp (). Now we’re able to find out how much time we spend on the conversations usually. Nice tips! Random question – what are you using to pixelate your screenshots?